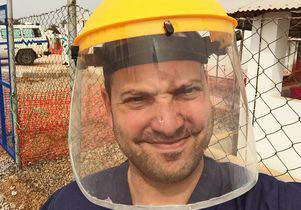 Dr. Matthew Waxman in a protective hood, one piece of the head-to-toe gear he wore to avoid contracting the highly contagious Ebola virus. Dr. Matthew Waxman wrote this essay upon his return to Los Angeles in March from Sierra Leone, West Africa, where he treated patients suffering from the deadly Ebola virus. Waxman is an assistant clinical professor of emergency medicine at the David Geffen School of Medicine at UCLA and an attending physician in emergency medicine at Olive View-UCLA Medical Center. His expertise in emergency medicine and his specialized training in tropical medicine and hygiene have taken him to work and lecture in Southeast Asia, Africa and South America. I am under quarantine at home since returning from Sierra Leone, where I spent two months in a rural clinic treating patients with Ebola. For three weeks, I must take and log my temperature up to six times a day. If my temperature stays below 100.4 degrees — the threshold for a suspected case of the disease — I can leave the house for a few hours, but I can’t be among large groups of people, go to work, ride public transit or leave Los Angeles County. Twice a day, I have to check in with public-health officials, once face-to-face and once by phone. I am fixated on news about the epidemic, and I text often with my colleagues in Africa. One night, I learned that our treatment unit was full of new admissions. The staff lamented the lack of seasoned providers after some of the best nurses and doctors returned home. Only one week back in Los Angeles, and already, like a battle-worn combat veteran, I felt the pull to return to my buddies at the front. Los Angeles to Chicago to Brussels to Dakar, Senegal, to Conakry, Guinea, to Freetown, Sierra Leone. At 2 a.m., on the four-hour drive from the airport to the clinic, Mahmood, my driver, hits a dog and kills it. He drives faster, telling me that if the owner comes, a price will be extracted. Mahmood worked as a driver for an iron-mining company, and, he says, Ebola has brought him luck. This job driving medical volunteers from the airport pays three times what he made driving South African miners. 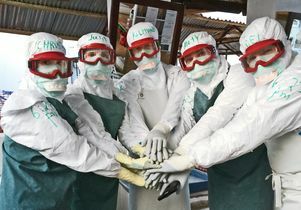 Waxman (second from right) and other volunteers broke a strict ‘no-touch’ rule in a show of team unity before starting rounds on a colleague' s last day at the Lunsar Ebola treatment unit. It is pitch black, but I can make out the shape of something off in the distance. It is one of the “centers,” Mahmood tells me. We pass a compound of white canvas tents, generators, crushed gravel, rusting shipping containers, barbed wire, 10,000-liter tanks of water on wooden scaffolding and hundreds of rubber boots drying under the fluorescence of the outdoor lights. This epidemic has brought the brutal complexities of modernity to the Port Loko countryside. The sun is up when we arrive, and after some peanut butter and toast, Kelly, a volunteer ER nurse from the East Coast, asks if I am ready for training. She was in Liberia at the height of the epidemic. In the world of Ebola, experience is everything. An Ebola expert, Kelly says, is someone who has been taking care of patients for a week. You may be a professor and perhaps have written hundreds of papers about Ebola, but if you’ve never worn the suit that was pictured on the cover of Time magazine or taken care of an Ebola patient in 104-degree heat, then you are not very useful here. Kelly is the expert, and she commands respect. Inside the treatment unit, we learn how to put on the suit: rubber boots first, then scrubs, chemical suit, hood, gloves, face mask, ski goggles, another pair of gloves. This is called donning, and it is overseen by Sierra Leonean colleagues who are never satisfied with the corners of our masks, the tightness of our goggles or the way our long zipper is taped closed. They are one of a cadre of staff dedicated to preventing an infection and keeping our unit running. There are electrical-generator mechanics, logistical supervisors, welders, cooks, water engineers, nurses, psychosocial-support staff and epidemiologists. Two days later, Kelly has us running and doing pushups in the suits. We are mastering doffing, the opposite of donning: taking off our suits in a precise order and washing our hands 15 times in the process. Vanessa, the director, watches silently, making sure the “fresh docs” aren’t going to be a liability by not following protocol. Picking up the phone to inform the U.S. Embassy in Freetown of an “exposure event” is not a call she ever wants to make. Four days since arriving in Africa, I am told by Kelly, “Dr. Matt, you are ready to go inside.” “Inside” is the fenced ward where patients with Ebola are taken care of. Look but don’t touch, Kelly tells me on my first trip beyond the fence. It is quiet inside. After donning, Dr. Joel, an expert at the end of his six-week tour, and I enter the unit and come to the bed of a small child, the same age as my son at home in Los Angeles. Residents of one of the rural villages that were set up for medical treatment of Ebola. Handing Dr. Joel a needle to start an IV, I am apprehensive as all of my considerations of safety and anxiety about contracting Ebola hit me at once. Dr. Joel asks me if I am scared. “Yes,” I tell him. He offers me his own take on the famous quote by World War I flying ace Eddie Rickenbacker: “Courage is doing what you are afraid of because it is the right thing to do.” I feel better. Three weeks later, almost halfway through my tour, I now am the expert. There is a new admission, a 5-year-old boy named Ibrahim. Two new nurses I am training and I are told that Ibrahim was playing ball in his village, not far from our treatment center, and then was found unconscious and with a high fever after using the toilet. My experience tells me Ibrahim may not have Ebola. The sudden onset of his symptoms and high fever suggests that his malady is cerebral malaria. Only in the setting of this epidemic would the diagnosis of such a severe disease offer a glimmer of hope. I thread the IV through his tiny vein, flush, and push antimalarial medication, then move on to the next patient. Three hours later, drinking an orange soda while being hosed off by a colleague, I hear Ibrahim is able to sit up and ask for water. After sharing the courage quote passed on from Dr. Joel with my new nurse colleagues, we savor this rare victory. 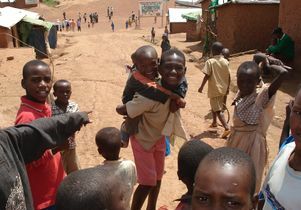 Now that I am home, I am asked how many people we saved in Sierra Leone. My answer is that we saved very few. But in saving those we could, I came away from the experience with much more than I expected: deep gratitude to have played a role in helping to curb a historic epidemic, appreciation for the opportunity to live with and learn from such dedicated volunteers at the clinic and thankfulness for the camaraderie of my colleagues, which I shall not ever forget. This story was originally published in the Summer 2015 issue of U Magazine, along with a related Q&A with Waxman.